5.25" X 4.5" Jumbo House Jar Opener. Individually polybagged. Colors: black, white, blue, navy, red, green, lime, yellow, orange, purple, teal, pink, burgundy and tan. Price includes one color imprint. $40.00 set-up charge per color. Add 14 cents each for second color imprint. Huge imprint area (3.75" X 3.25"). 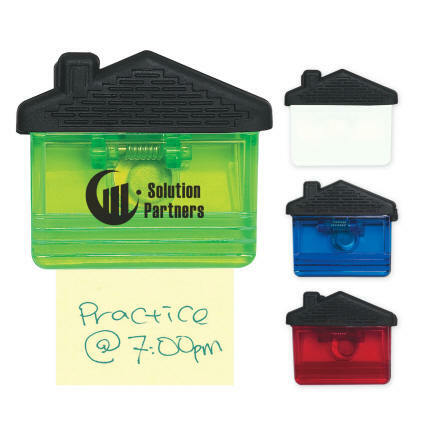 House-Shaped Magnetic Clip. Powerful magnet on back. Rubber grip roof top. Spring loaded hinge. Translucent red, blue or green or solid white w/black rubber grip. 1.5" X 5/8" imprint. Price includes one color imprint. $40.00 set-up charge. $25.00 on reorders. Packaged in cello bags. 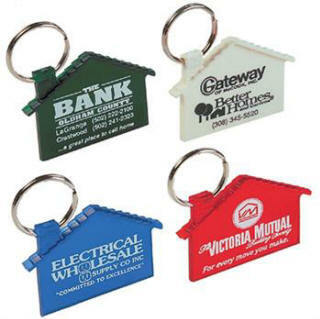 Homestyle Keytags. Realistic details on chimney and roofline. Red, blue, green, white or assorted. Imprint area: 1.5" wide by 1" high. No set-up charge for line copy. 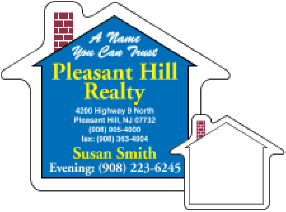 $50.00 set-up for logo or special type. No eyelet to open, so keytag will never come apart. Soft and flexible. House-Shaped Stress Reliever (squeezable). White with red and gray trim. 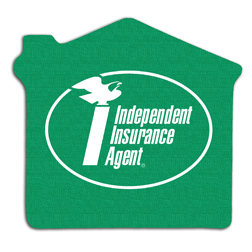 Imprint area: 2" wide by 7/8" high on front of roof. Can also be printed on back of roof (optional). Set-up: $55.00 per color per location. $25.00 on exact re-orders. Extra colors or positions: 35¢ each. 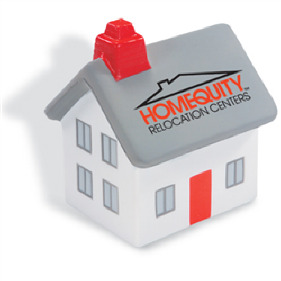 House-Shaped Magnet printed in full color. Size: 2.5" X 2" X .019" thick. Prices include 1 to 4-color process digital printing. No set-up charges for orders with approved digital art or for copy in stock type. Add ten cents each for .036" thickness up to 249 magnets. 250 or more add three cents each for .036" thickness. A larger house magnet (3 5/8" X 3 7/8") is available. Call for a quote. 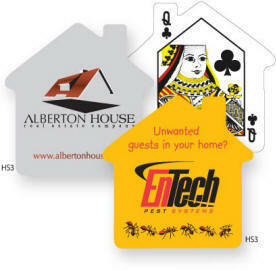 House-Shaped Playing Cards. Card size: 2 7/8" by 2 7/8". Imprint area: 2 5/16" by 2 1/2". Minimum border at edge: 3/16". Pricing includes 4 color process printing. Set-up charge is $75.00. $45.00 on exact re-orders. Minimum order is 500 decks. Each deck is packaged in a square plastic box. Available in red, blue, white, yellow, granite, translucent red, blue, green. Price includes one color silk screen design. Set-up charge $55.00. $30.00 on repeat orders. Item size: 2.75" X 2". Imprint area: 2.25" wide by 2" high.